A few days ago, with a half-hour to kill, I put a line in my favorite spot at the river. With trout, that’s usually enough time to hook up, but not with carp. At least, that’s the way it rolls on our river, and for moi. But I did get to see one jump way out of the pool, then come down in an inelegant belly flop. Last year, when I started carping, I’d see this and think “Oh, man, am I ever gonna hook that sucker,” but not anymore. Jumping carp are interested in something, but not eating a fly. So … why do they jump? Fun? Recreation? Boredom? “Shallow-water hell raisers are exactly that: carp that are making a spectacle of themselves by leaping, splashing, and thrashing in the shallows. These fish seem utterly oblivious to the dangers they may face by drawing attention to themselves. True … see Carp Clubbing entry on this blog. 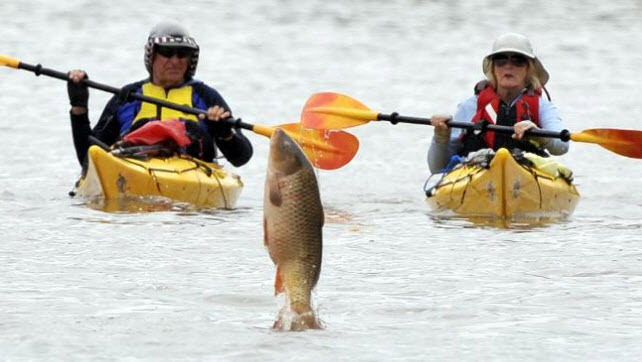 Often, there is a reason for this, particularly in the spring when carp are spawning. As you might expect, spawning fish are usually not very interested in your fly — they have other things in mind. True, but this happened in June — no spawn on. But at other times, these hell raisers are carp that are smashing through schools of baitfish and they’re a very good target for a small streamer. False for the L.A. River. I’ve never seen a school of baitfish on it. I put together this poll from various answers found on the Web. Any fish biologists out there care to clear up this mystery? My goldfish, Captain Spaulding, committed suicide. Of course, he was really an infant carp. I know that now. RIP. A fishtank is not a good home for a jumper. Euthoria , Cleaning gills from bottom feeding , Equalising the swim bladder , spawning , removing leeches et al. As for carp not being catchable of the surface I would say quite the opposite , easier to catch on the surface , pedigree chum mixers fired out in your peg and one on a hair rig with controller and away you go , its breathtaking fishing . In deep rigs and bait sections are exceptional. This is very cool. Thanks for the info! They also seem to jump in response to a jump. Seconds after a jump, another jump within about 150 yards may happen, yet nowhere else within 500 yards at this reservoir where I fish for bass. Could they be communicating as whales do? Territorially sending a message perhaps along with underwater sounds to indicate status or location? It’s after breeding season, in fact July or August. The oxygen deprivation theory is a good one for sure, but all they would need to do is sip fresh air at the surface, no need to expend the energy to charge up to the surface and breach.